Having tackled toys, monsters, fish, cars, superheroes, rats and robots, the creative team at the studio decided this time, for its first film in 3-D, to center a story around a grumpy septuagenarian balloon salesman named Carl Fredricksen. “We started off with this list of things we’d always wanted to play with, and an older, grumpy guy was definitely on that list,” said the film’s director, Pete Docter. Inspired by the cartoons of George Booth in The New Yorker, Mr. Docter and his co-director and co-screenwriter, Bob Peterson, wanted to create a curmudgeon with audience appeal. 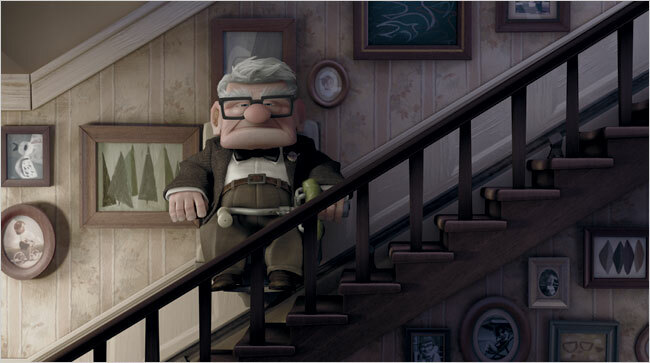 Early in the film, the widowed Carl has isolated himself from the world. Facing a court edict that would put him in a nursing home, he resists by strapping balloons to his house and floating to Paradise Falls in South America, a place he has dreamed of since he was a boy yearning to be an explorer. On the way he meets offbeat characters (including a pudgy 8-year-old named Russell and a dopey dog named Dug) who shake him out of his stiff, cantankerous shell. Okay, they kind of lost me there. Why is it that all cranky old geezers have to go through a heartwarming transformation in which they mend their codgerly ways and become loving grandfatherly types? I don’t know if this is what happens to Carl, but the description makes me suspicious. I don’t see why Carl should have to undergo an attitude-adjustment. It sounds like he has good reason to be pissed off, what with people trying to stick him in a nursing home. Maybe his home got foreclosed on, too, because he lost all his retirement savings in the stock market. And I’ll bet Medicare Part D wouldn’t pay for his happy pills. Apparently, Wall Street believes that the key audience for Pixar films–pre-pubescent males–won’t be interested in a flick about a grumpy old man. Richard Greenfield of Pali Research downgraded Disney shares to sell last month, citing a poor outlook for “Up” as a reason. “We doubt younger boys will be that excited by the main character,” he wrote, adding a complaint about the lack of a female lead. Worse still, no one is going to want to buy a geezer action figure, or any of the other spinoffs that often end up making more money than the movie itself does. Target and Wal-Mart say they will stock little “Up” merchandise, mainly because there was not much interest from manufacturers: Thinkway Toys, which has churned out thousands of Pixar-related products since 1995’s “Toy Story,” will not produce a single item. Disney Stores will offer “Up”-related products, but even that will be on a limited basis, according to analysts. So talking toys and cars sell, but haute-cuisine French rats and pissed-off old codgers, apparently, are a bust at the merchandizing counter.